To quote Ayckbourn himself, “I think if I’ve contributed anything to the sum of modern playwriting it has been to encourage comedy and drama to exist together as in days of old”. GamePlan certainly does this. Set in a luxury apartment overlooking the Thames the plot concerns Sorrel Saxon’s endeavours to boost the family income after the departure of her father leaving the family in substantial debt. Her unconventional approach to making money is aided and abetted to hysterical effect by her best friend and “maid” Kelly Butcher. Fun for all. On the face of it, it all sounds rather seedy. A 16-year-old schoolgirl, desperate to cling on to her comfortable middle class lifestyle, tries to boost the family budget by becoming a prostitute. 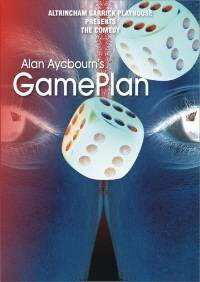 But in the hands of Alan Ayckbourn it is the recipe for a beautifully observed and at times hilarious comedy, from a writer who is, undoubtedly, a master craftsman. Sorrel, an academic bright spark, decides to rope in her best friend Kelly to help her run her new "business." Imagine Mrs Overall as a teenager and you have Kelly. She's about as much use as a chocolate tea pot and yet, thanks to Sarah Roberts' outstanding performance in Altrincham Garrick's production, you can't help feeling over protective towards her. Or, to put it another way, she's a lovable geek. Sorrel is played by Garrick newcomer Jacqueline Hardy and I predict offers of future roles will come thick and fast after this self assured and convincing performance. In real life, Jacqueline is in her 20s but she convincingly recreates the mood swings and temper tantrums so familiar to the parents of teenage kids. I liked the way Ayckbourn strips this character of her sexual bravado after her first and only encounter with a client. That particular client is Leo, a boring windbag who could talk the hind legs off a donkey. To give you an idea of just how mind numbingly tedious, he gives Sorrel and Kelly a potted history of his dry cleaning business. Martin Oldfield's performance is perfectly pitched and he brings this character infuriatingly and authentically to life. Leo is the type of guy you would find in the kitchen at parties, boring the budgie off its perch. I first saw this play on the professional stage in Manchester and this production is certainly as good. Yet another triumph for director Angie Wetherill and a theatre company who can't put a foot wrong.